After attending a Saint Francis Brewing Co. event at Ray’s Growler Gallery, we were inspired to take a trip to the Saint Francis Brewery for dinner. In addition to their seven original beers on tap, the brew-pub offers an extensive menu with everything from fish frys and burgers to ribs and jambalaya. The restaurant is spacious with a large bar area and several dining alcoves. Thus, although it was busy, we were able to get seated within 5-10 minutes on a Friday night. 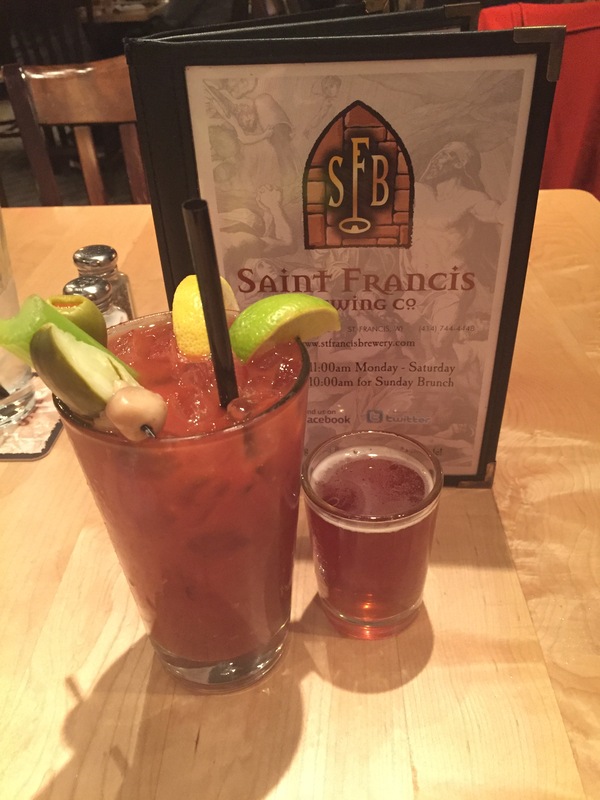 While Saint Francis is known for its beer, obviously, I wanted to be sure to sample their Bloody Mary while I was there. Their menu said they have them on special on Saturdays and Sundays, so I figured they must have a good one. Plus, bonus, I’d get to sample their beer via the chaser, the best of both worlds. The Bloody Mary was pretty standard, but good. The pumpkin beer was spicy and delicious. We enjoyed our food as well. The only downside occurred when we received our bill. Now in the grand scheme of things, we realize $1 is not a big deal, but the fact that this is a brewery just compounds the issue. Don’t you want people to sample your beer? Don’t you have a lot of it back there? If they really need to turn that profit, in my opinion, they would’ve been better off charging $7 for their bloody mary than looking like they are nickeling and diming their customers for a beer chaser. We didn’t bring this issue up at the time of dinner because, like we said, it’s not a huge deal, just something we thought very odd and something that did not sync up with the rest of our experience. If we ever return, we’ll stick to ordering beer as our beverage of choice. 11/16/15 Update: See the comments below! 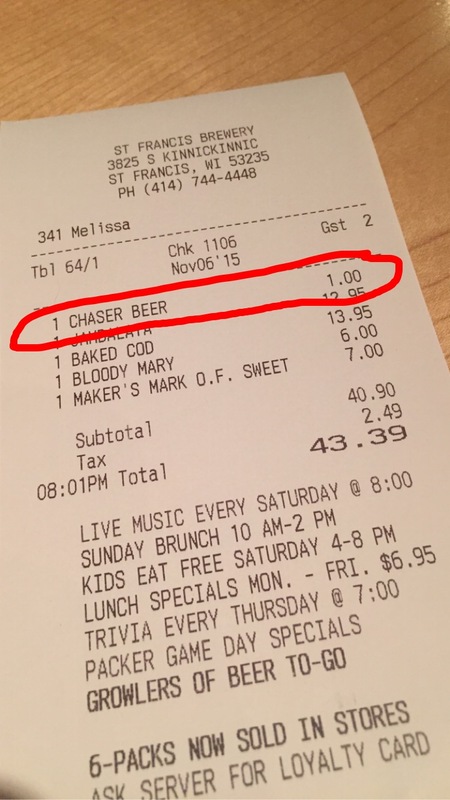 St. Francis Brewery took our review to heart and is eliminating the $1 chaser charge! Good news for all the Bloody Mary lovers out there! 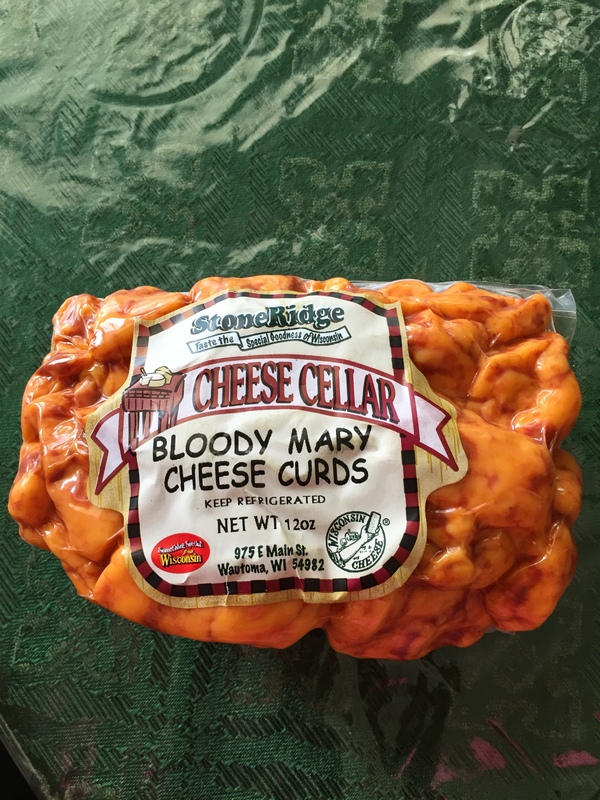 I can’t believe we haven’t come across these earlier… Bloody Mary Cheese Curds! Made in Wautoma, Wisconsin by Stoneridge, these cheddar curds are seasoned with tomato powder, worcestershire powder, celery salt and jalapeno pepper juice. We were excited to try these; however, while they were good (have you ever had a bad cheese curd? ), had we not known they were Bloody Mary flavored, we wouldn’t have guessed that was what they were trying to achieve. Perhaps some horseradish or pickle juice would help? Still, we recommend–a great addition to your build your own Bloody bar! Yesterday, I played golf at University Ridge in Madison, Wisconsin. Post-round, I enjoyed a Bloody Mary at their Clubhouse bar. This Bloody Mary was good and hit the spot, but it wasn’t anything special (although the 5 Peppers mix is quite spicy!). 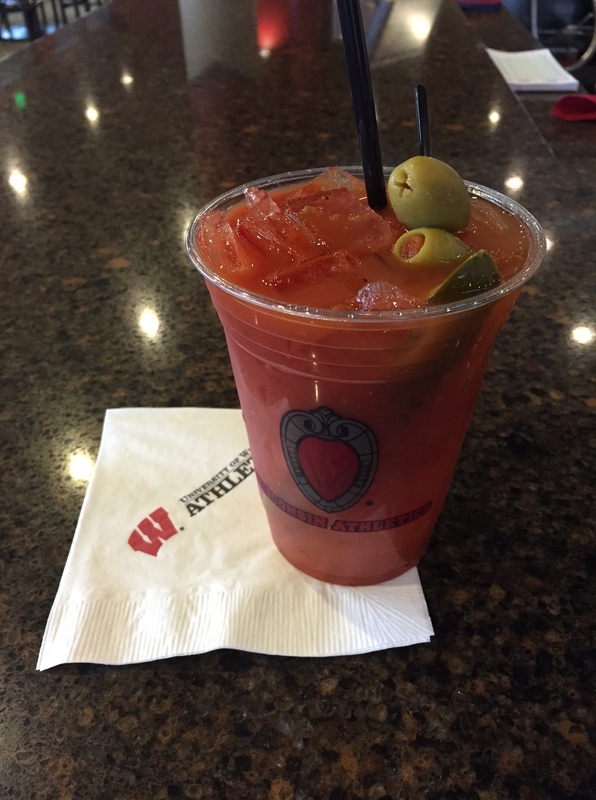 If you want a great Bloody in Madison, check out Bluephies. I recently stopped at Water Street Brewery, a brewpub with three area locations, brewing a variety of award-winning traditional and specialty beers from ambers and ales to stouts and seasonals. 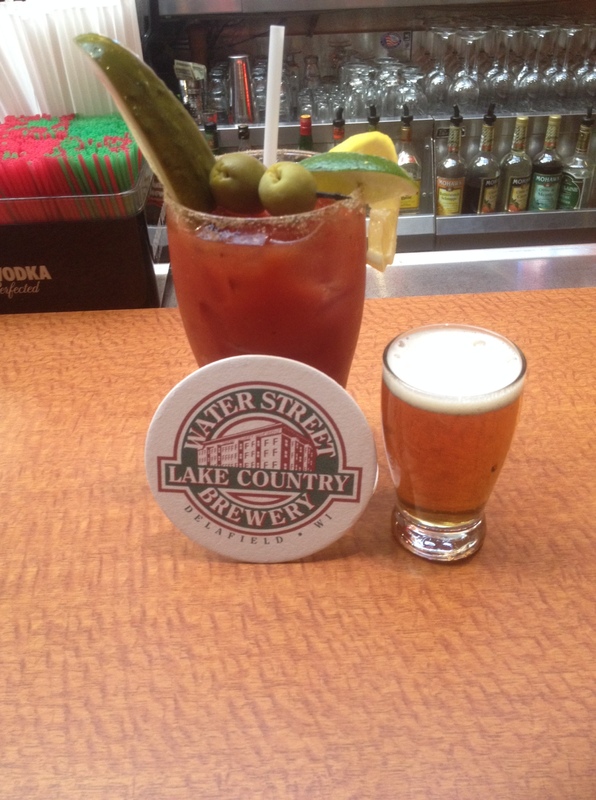 While their beer is good, I had never had a Bloody Mary here, so I stopped in at the Lake Country location and ordered one up. I was happy to get to select my own chaser because Water Street Brewery offer an ever-changing selection of delicious beers on tap and given that it’s mid-September, they had a delicious pumpkin pie beer on the menu. I know what you’re thinking: Bloody Marys and pumpkin beer don’t really go that well together, do they? No, not really, but if you drink each separately, you have the best of both worlds. Anyway, read on for the stats. 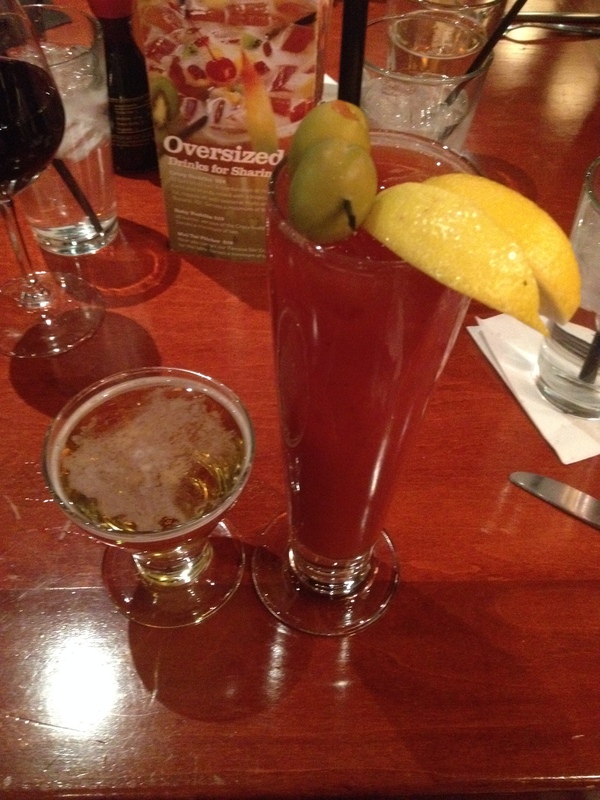 The flavor of this Bloody was very good–you could detect the horseradish, but it wasn’t too spicy. I liked the salted rim on the glass, a nice touch. This Bloody Mary was decent, but when the bartender came to ask me if I’d like another, I chose a full pumpkin pie ale instead. 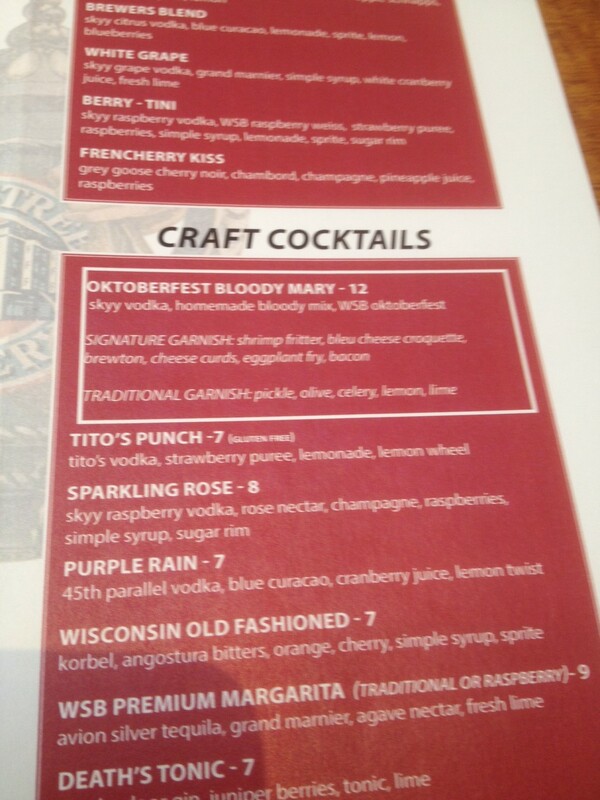 They have a special Oktoberfest Bloody Mary! For just $4.50 more, I could have had the “signature garnish,” a shrimp fritter, bleu cheese croquette, brewton, cheese curds, eggplant fry and bacon. “Yes,” he admitted, perhaps sensing that something was amiss. “But that’s more like a meal,” he said quickly, trying to deter me, as if there were a problem with that, as if that wasn’t what I lived for. I hung my head in disappointment. “If I would have known, I would have ordered that one.” I told him. He didn’t apologize or offer to do anything for us. My dining companion decided not to order a second beverage and instead helped me finish my pumpkin beer and we quickly left following that exchange. I guess I am partly to blame for ordering without looking at a menu first, but clearly this was special beverage created for this time of year, so I am not sure why this wasn’t suggested or offered when I initially ordered the Bloody Mary. Lesson learned. In the future, I will ask more questions. 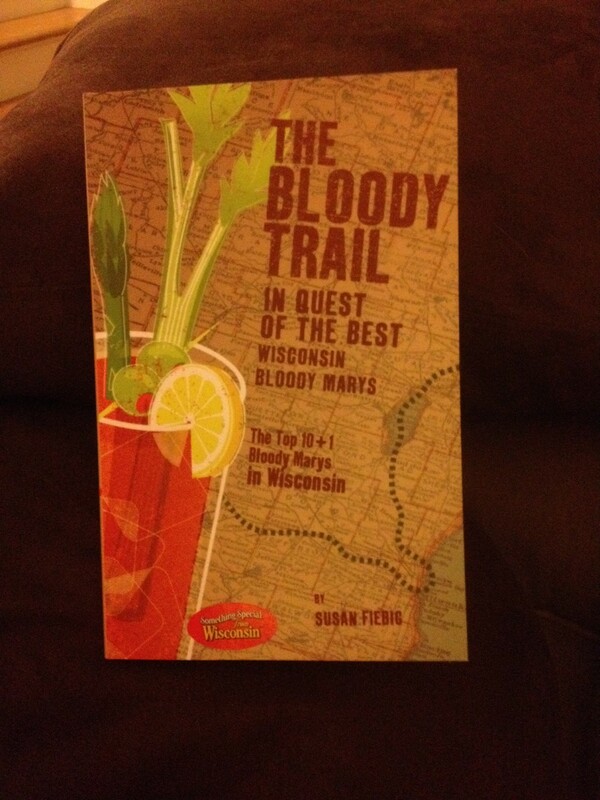 When Susan Fiebig was interviewed on “The Morning Blend,” talking about her new book, The Bloody Trail: In Quest of the Best Wisconsin Bloody Marys, I received many messages from friends and family. Essentially, they believed Susan had written the book version of this blog. But, just as with Shelley Buchanan and Judy Bennett, other Bloody Mary aficionados who have Bloody Mary blogs and/or have written books, though, I wasn’t angry or jealous. No, we’re kindred spirits. So, I reached out to Susan via her website ,explained that we share a similar passion, and we arranged to meet–over Bloodies of course! 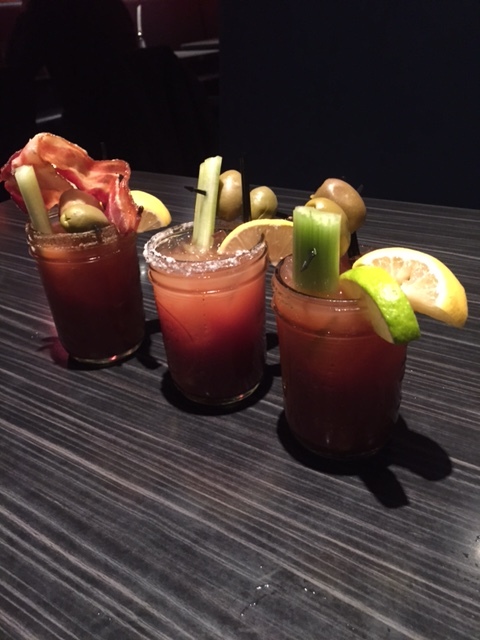 While imbibing and dining at the new Cafe Bavaria in Wauwatosa, we talked about how we both fell in love with the Bloody Mary and discussed the nuances of what we think makes a Bloody Mary good. Of the bloodies (and mixes) we had both tried, we shared many of the same favorites; however, while I pretty much report the facts (mix, fixin’s, price, chaser, etc.) because I believe each person has their own Bloody Mary standards (some like fixin’s, some don’t; some like spice; some are bland, etc. ), I realized that Susan has a much stricter rating system which allows her to compare bloodies to one another. Of Susan’s Top 10, I have reviewed five already personally and would have to agree (like I said, we share the same taste). I’m also looking forward to visiting her other recommendations in the state. One unique feature of the book is that each copy comes with a self-addressed, stamped postcard (see photo above) imprinted with the rating scale. 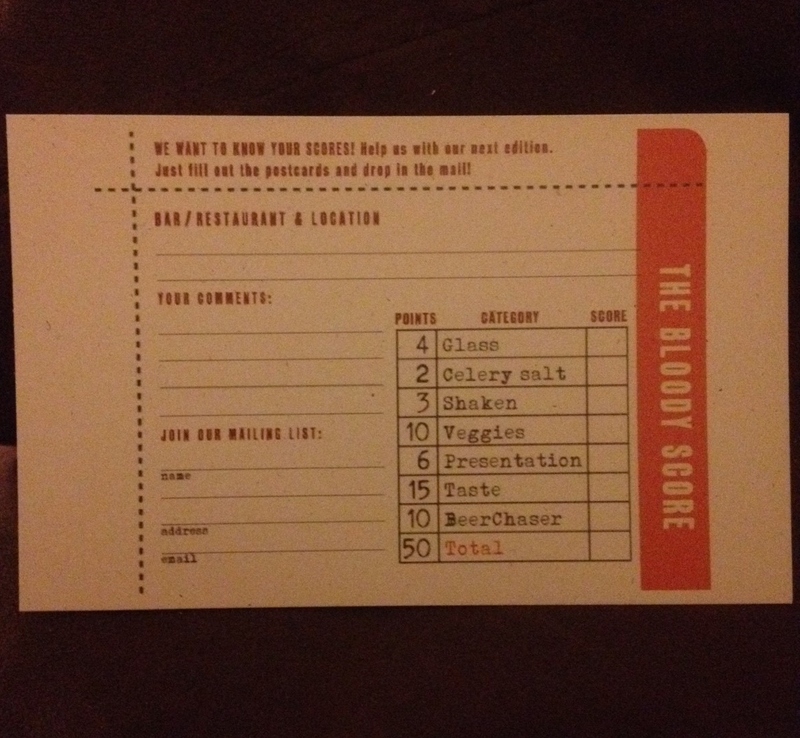 If you spot a Bloody you think is worth Susan’s time, fill it out and drop it in the mail. She may try it out and see if she agrees with you… and it may make it in another book. Yes, Susan shared with me that she’s working on a second edition, expanding her horizons across the U.S. From my travels and reviews here on the blog, I’m afraid she’ll have a hard time finding bloodies to rival the ones found in Wisconsin, but I’m sure she’ll certainly have fun trying. As I’ve said before–in this “business,” we don’t consider ourselves competitors, but rather co-conspirators, searching for that ever-elusive perfect Bloody Mary and having a blast trying. Good luck, Susan. Well done on the book! 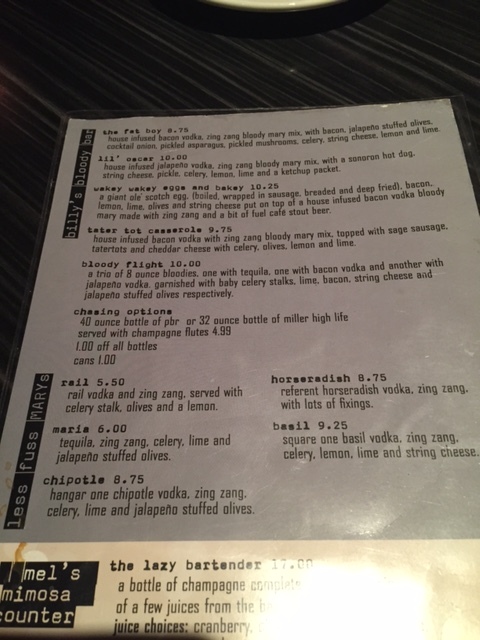 Last weekend, I visited Stir Crazy in Brookfield, Wisconsin for dinner. This was not my first time at this restaurant (it is a chain), but it was my first time ordering a Bloody Mary here. This Bloody Mary had nice flavor to it, but unfortunately, my taste was soured by an unfortunate incident–our server accidentally spilled a glass of wine on my sweater. Of course, the wine was red and my sweater was a lovely cream color. Obviously, the server did not do this on purpose and was very apologetic. A manager quickly stopped by and offered to take care of the dry cleaning bill. The round of drinks was on the house. However, by this time, it was too late. Our dinner was off and running to a poor start, compounded later that night by a disappointing movie. But that’s neither here nor there. The Bloody Mary itself was very good, especially considering the circumstances and the fact that it was from an Asian Grill chain where one would not be anticipating anything special. I might not be going back to Stir Crazy anytime soon, but if you find yourself there, rest assured that the Bloody Mary isn’t bad. Just maybe wear a bib.